How is your dental hygiene? Most dentists recommend brushing teeth at least twice a day. The most important times to brush are in the morning, after you eat breakfast, and at night, before you go to bed. Dentists also recommend that we floss our teeth regularly – once per day. The best time to floss is usually after you eat a meal. Another overlooked aspect of oral health includes scraping your tongue. Scraping your tongue every morning has many positive health benefits including better breath, an improved sense of taste, and removing toxins from your body that leach out of the surface of your tongue while you sleep. How To Choose The Best Tongue Cleaner For You? The first item to consider when choosing a tongue scraper is the material it is made out of. Tongue scrapers come in plastic, stainless steel, and sometimes copper. Plastic tongue cleaners are disposable after short-term use. They are not one use only, but it is recommended that you replace plastic tongue cleaners regularly due to the microscopic voids or pores in it where bacteria can make a home and start to multiply. Sterilizing plastic can be next to impossible, so you have to throw it away. Most experts recommend that you replace your plastic tongue scraper every three months to avoid any issues. Plastic tongue scrapers are more affordable due to their disposable nature. Stainless steel or copper tongue scrapers will cost you a little more money. That’s fine because metal tongue cleaners can last for a long time. Metal tongue scrapers never wear out. You simply place them in boiling water or a sterilizing solution every couple of months, and they are ready for use once again. Metal tongue scrapers aren’t for everybody, though. For people with sensitive tongues, dentists recommend plastic tongue scrapers because they are gentler on the tongue. This may seem like an obvious point, but many people don’t think about it. Statistics put the average length of a tongue at four inches. This means that your tongue scraper should be four inches long plus extra for grabbing onto. A good grip length is a minimum of three inches, so look for a tongue cleaner that is at least seven inches long overall. A longer scraper will work just fine, but a shorter scraper could make cleaning your tongue extremely difficult. Width is another important factor when selecting a tongue scraper. A wider tongue cleaner can save you time by requiring fewer passes to clean your tongue. If you have a strong gag reflex, you probably don’t want a wide tongue cleaner. Tongue cleaners with wider, thicker cleaning heads are more likely to make you gag. If that’s not an issue, wider is always faster. One of the great perks of modern technology is the ability to access user reviews. Internet shopping sites like Amazon include reviews from people who have bought and used the product. Take the time to browse through user reviews to see what people have to say. Remember that people who take the time to write a review are either very happy or really unhappy with the product. User reviews can help you narrow down your number of choices and reach a decision. Don’t be afraid to try several tongue cleaners. If you don’t like them, throw them away and try something else. If you find a tongue cleaner that you like, you are much more likely to use it. You can also ask your dentist if he/she recommends any tongue cleaners. This is a complete dental care kit from PrimeDentalPro. This kit includes a stainless steel comfort grip tongue cleaner/scraper, a stainless steel double-ended tartar scraper/remover, and a stainless steel double-ended dental scraper/scaler. These three fine instruments come inside a zippered case with a velvety red liner. If you’ve ever wanted a go at your teeth with quality dental instruments, this is the kit for you. It also makes a fine gift for dental professionals or anyone who takes care of their teeth. This kit can also be used to take care of your pet’s teeth (buy your pet a set of their own). This is a nice set of instruments and they come in a convenient carrying case. We liked the fact that the stainless steel tools can be easily sterilized in boiling water, or with isopropyl alcohol. They also really like the tongue scraper included in the kit. Many users noted that while they have had trouble using a tongue cleaner in the past due to gagging, the tongue cleaner in this kit was much better for them to use. The tool is sharp, so you need to be careful while using it. This is a four pack, or a year’s supply, of Orabrush’s tongue cleaning tools. These tongue cleaners feature a soft bristle brush to loosen up material that is lodged in the cracks and crevices of your tongue and a scraper blade which you then use to remove any material, mucous, etc. These tongue cleaners are made from plastic, so you will need to replace them every three months or so. These tongue cleaners are 10 ½ inches long overall, which is plenty of length for most people. The width of the head is 1.2 inches, which is pretty average as far as tongue cleaners go. These tongue cleaners are very affordable, and most consumers really like the brush/scraper combination. 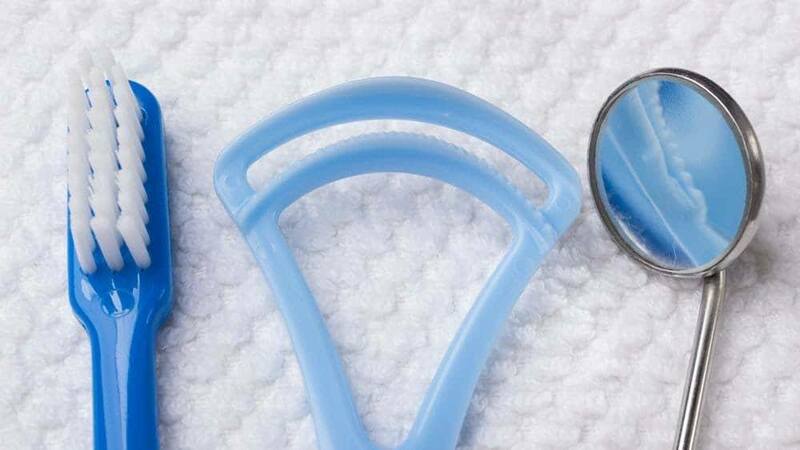 ​This tongue cleaner made by Dr. Tung is a straightforward, no-nonsense tool. This tool is a stainless steel loop with two comfort grip handles made from a rubber-type material on the ends. The dimensions of this tongue cleaner are eight inches in overall length and 2 ½ inches in width. This is an affordable tongue cleaner that should last you a long time. We love how well it cleans their tongue and the ease with which they can sterilize it. We also like the comfortable grips which prevent slips when using the tool. Negatives included the fact that it takes up more drawer space than many other tongue cleaners, and that the stainless steel can be bent pretty easily if you aren’t careful. This tongue cleaner from Pureline comes in a three-pack. It is made out of a plastic-type material similar to the substance that they make toothbrushes with. This tongue cleaner is 11 inches long overall, and 1.2 inches wide. These are pretty standard measurements for a disposable tongue cleaner. These are good quality, affordable tongue cleaners. We love the strength and rigidity of the frame on the Pureline as compared to thinner, more flexible tongue cleaners. We also like the fact that they were able to extend the Pureline’s life by cleaning it with hydrogen peroxide or denture cleaner. We felt that these tongue cleaners were too wide, and caused their gag reflex to kick in every time they tried to use them. We don’t appreciate that the plastic coating on the handle tended to peel off after only a few weeks of use. There is a type of simplicity to the HealthAndYoga tongue cleaner made by SoulGenie. This tongue cleaner is made out of surgical grade stainless steel, and nothing else. This helps to keep bacteria from growing anywhere on this tongue cleaner. In order to sterilize the HealthAndYoga, you can either drop it into boiling water or wipe it down with isopropyl alcohol. Easy cleaning is a great feature of any tool you put in your mouth. The tongue cleaner is 11 inches long and about 1.2 inches wide at the bend. This is a nice simple, design for a durable tongue scraper that is also surprisingly affordable. After reviewing all of these great products, which one is the best tongue cleaner? The answer to this depends on if you are looking for a cheap disposable tongue cleaner or a more durable one. If you are looking for a tongue scraper to use and discard, I would choose the Orabrush Tongue Cleaner. Combining a brush with a scraper makes this a great tongue cleaning tool. I also like the fact that it comes in a pack of four, which will last an entire year. Plus, this scraper is affordable, so you will not feel bad that they are disposable. If I have to choose a stainless steel tongue cleaner, I select the PrimeDentalPro Tongue Scraper. I like the fact that I can get three high-quality stainless steel tools and a cool zip-up case for the same price as buying most other stainless steel tongue cleaners. The tools are very easy to sterilize, and should last for a very long time. All five of these tongue cleaners are great products for the money, but the clear winner is the PrimeDentalPro Tongue Scraper and Dental Tools Kit. Happy tongue cleaning! Dr. Tung’s Tongue Cleaner Review: Should You Buy?